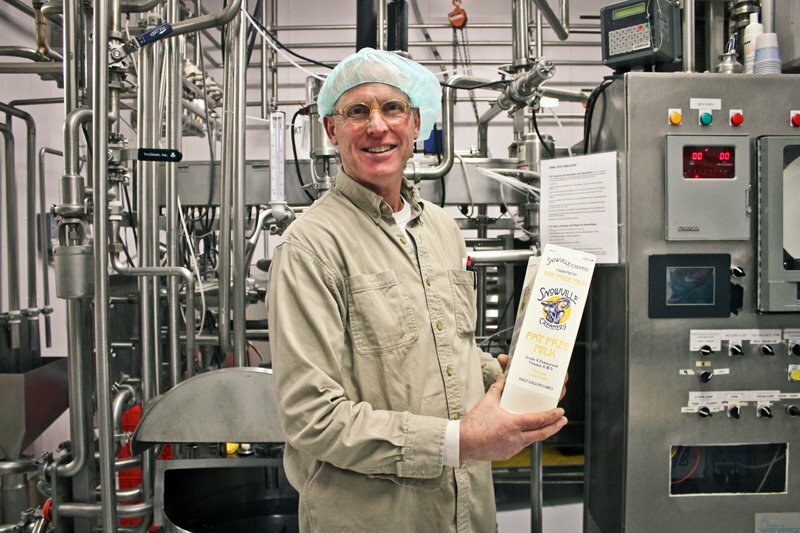 Snowville Creamery owner Warren Taylor holds a carton of milk in the processing room. POMEROY – Nestled in the hills of Southeastern Ohio’s Meigs County lies a 350-acre farm and dairy that’s revolutionizing the way milk is made in the modern day. 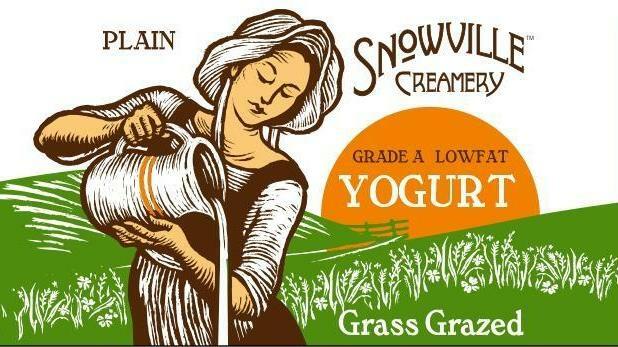 If it wasn’t for Snowville Creamery, my knowledge of milk’s flavor would be confined to a plastic gallon container purchased from the grocery store that’s ultra-pasteurized, homogenized and contains an undetermined amount of antibiotics. Luckily for me, soon after moving to Southeastern Ohio, I tried Snowville and was instantly hooked. I had no idea milk could taste so good, and I’ve been buying it ever since. Rather than heating milk for at least two seconds at 270 degrees Fahrenheit in an ultra-pasteurization process which many dairy companies with brands available in the grocery store currently use, Snowville heats its milk at a lower temperature but for an extended time – 20 minutes at 165 degrees Fahrenheit. When their milk is pasteurized, it’s done in such a way that kills any bacteria, yet still retains most of the flavor. In essence, the process Snowville Creamery uses in producing its milk was designed to keep it as close as possible to what naturally comes from the cow. And according to Warren Taylor, who owns the creamery along with his wife Victoria, keeping the milk as close as possible to what their cows naturally produce is essential for maintaining Snowville’s signature taste. That’s the second part to Snowville’s genius – they don’t homogenize. Although the cream produced for Columbus-based Jeni’s Splendid Ice Cream is homogenized to avoid having fat globules sticking to the roof of your mouth, if you buy a half-gallon of Snowville’s whole milk – and to a certain extent the 2 percent milk – it needs shaken before you pour yourself a glass or add it to a bowl of cereal. While most larger dairies homogenize their milk in an effort to create a more standard consistency, critics of the process argue it has less flavor than that of non-homogenized milk. Not to mention it’s healthier. Combine the lack of homogenization with Snowville’s pasteurization process, and you have the perfect glass of milk that’s the closest thing to drinking it the way nature intended – just with slightly more regulation so harmful bacteria doesn’t enter your digestive system. When I toured Snowville Creamery recently, I was amazed to see how small the milk processing room is, considering they create 14,000 gallons each week and have found a way to distribute it not only to places around Southeastern Ohio, but to Whole Foods in Columbus, Cleveland, Cincinnati, Pittsburgh and even Washington, D.C. Locally in Athens, Snowville can be purchased at Kroger, the Village Bakery, Athens Chocolate, The Farmacy, and Seamans. Not to mention Snowville is the dairy product of choice for many restaurants and bars in the Athens area. While the creamery itself is 6,000 square feet with multiple levels, the milk processing room is just 600 square feet. Yet keeping a smaller facility is more efficient because less money is spent on the building itself, explained Taylor, not to mention the amount of piping needed to clean and sanitize the system after each milk processing costs less than at a larger facility. The new yogurt machine is now in the creamery! It's just really big and they need to make room for it and assemble it properly. Look for yogurt to be in full production in the coming weeks! If there’s one thing Taylor knows, it’s good dairy products. He credits his milk tasting ability to Ohio State University where he went to become a dairy technician and engineer – and his dad, who also was a dairy technician. “My dad worked and had a dairy technology degree from Ohio State University, and he was really good at judging and tasting dairy products,” Taylor said, explaining his dad would bring dairy products home to taste test. “Kind of like wine-tasting, but just with milk?” I asked kind of jokingly. “Nope,” I say. I like wine, but can’t pick out the subtle differences between them. Maybe that’s a hobby for a later time. As a kid Taylor can recall milk tasting really good, although he admits he had to go to the dairy farms at OSU to learn how to milk a cow. “I joke that for me, milk came in a 6,000 gallon stainless tanker truck,” he laughed, standing at the entrance to the creamery, next to a crate of paper milk cartons ready to be used. After earning his degree from OSU to become a dairy engineer, he packed up and moved first to Wisconsin and later California where he worked for larger dairy operations. “In the 1970s all the milk was good, and especially in California it was really good because they were grass-fed cows. That was before all the confinement and things took off,” he said. “I was a hayseed Columbus boy and went to an engineering and dairy company in Wisconsin and spent a year there and then was transferred to Oakland, Calif., around Los Altos and worked on Sand Hill Road, which is still famous for being one of the innovative, Silicon Valley areas. I was working there doing dairy engineering and working on the first computer-controlled dairy in America, which was Safeway in Oakland,” he said. Warren’s journey eventually led him back to Ohio, where he met Bill and Stacey Hall, who own the farm where the creamery is located. Twice a day, the cows are taken to the dairy barn and milked, although some of them are currently on maternity leave until after they have calves. Warren and I pose for a photo at the end of the tour, each holding a carton of chocolate milk. He sent us each home with a half-gallon. The farm is nothing but rolling hills for acres and acres, and as far as you can see there is green pasture land. The cows are located just a few acres behind the creamery on this day, in a pen feasting on green grass. According to Warren, the grass is always green at Snowville because of the climate, eliminating the need to grain-feed them over the winter months. And when a cow falls ill, they are nursed back to health on the farm – sometimes with antibiotics and sometimes not. If a cow receives antibiotics, however, their milk isn’t used in the dairy process for several weeks after they’ve been brought back to good health. “They’ve got it made, and they’re healthy. They have smaller bodies, but they’ve got greater longevity and fertility. There’s no comparison between this operation and a confinement operation,” Taylor added. Warren undoubtedly considers himself a visionary, and during the interview he even compared himself to being the Arnold Schwarzenegger of the dairy industry. But it’s only because he knows that Snowville Creamery is one of the best dairy operations in the country. Taylor sees Snowville Creamery being on the precipice of changing the food industry in Ohio, and it’s just one reason he’s running for U.S. Congress as an independent candidate. Taylor envisions creating food hubs in all the cities as a way to organize and transport fresh produce to all the metropolitan areas. Taylor takes issue with large companies that he says are trying to create a monopoly in America and push out the small, local farmer. “To me, the American Dream has been absolutely pirated, and the same things happened in the dairy industry,” he explained. “A few decades ago, a dairy farmer got paid about 50 cents of every dollar a house wife paid at the grocery store. Today they get 25 cents. And the company that gets the extra 25 cents is called… and they control half the milk in America. It’s terrible. And if they could take me behind the barn and put a bullet in my head, they would because all they want is a monopoly. And they don’t want anybody to know that milk is a different way,” he said. “The revolutionary side of this is we’re capable of doing this ourselves, just like we’re capable of electing good people into Congress,” Taylor said. 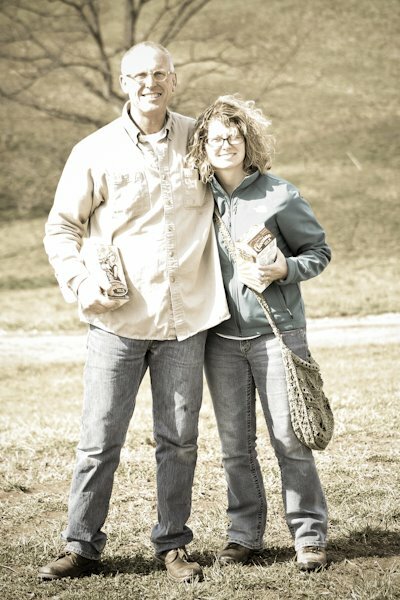 To learn more about Snowville Creamery, visit their website at www.snowvillecreamery.com. So you think you know local food?